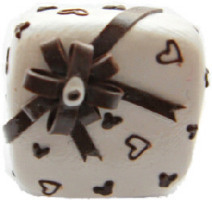 Miniature food chocolate cake now ring made from dry clay. Adjustable silver plated ring. Can fit any size finger. Due to the handmade nature of these types of products styles and sizes may vary slightly from picture.